Recently dusted off my TV after sitting for 10 yrs. Have an old Maganvox 13" color crt unit. Also have an Access HD DTA1010 digital converter. Have constructed 3 DIY antennas & am currently using an omni directional that pulls in quite a few signals. Have noticed that on my stations that are 50 miles & farther, the signal will come & go. Station might be on for an hour & then it will fade out, may come back on anywhere from 10 minutes to a few hours later. Would a Preamp help keep the stations on longer? 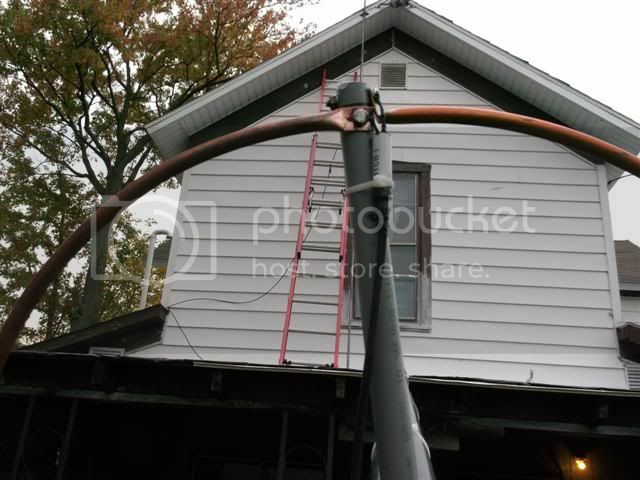 My antenna is a bit over 30' in the air (9' above rooftop) with some trees nearby. Clear view of North & West. Terrain here is mostly flat. NW Ohio. I have 4 local stations within 10 miles of home. Aside from me, you are the only other person I have heard of who has tried a horizontal loop antenna to try to receive FREE OTA TV. My results were poor, most likely do to its' omni-directional nature and multipath signal reception. Question: how well does it work for you? What are the lengths of your 'Vees' and their spacing? For today's UHF television band, the 'V' elements should be 10-10.5" and spaced around 9.5" away from each other. Your design is dual-directional, but you can achieve unidirectional reception and additional gain from your antenna if you add a reflector screen. You may not need to use an amplifier. 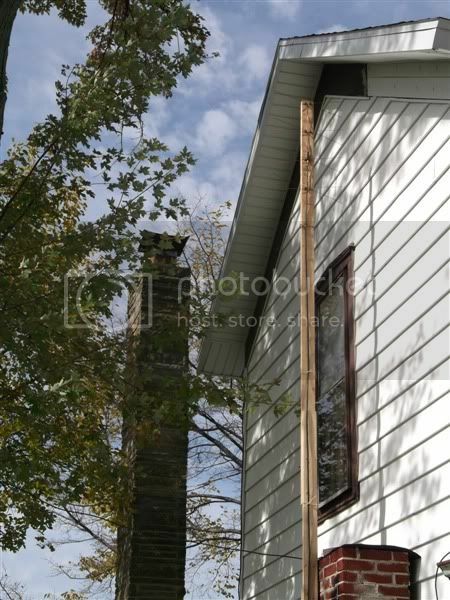 PS I hope your second chimney (where that antenna is mounted) is not being used as a chimney! 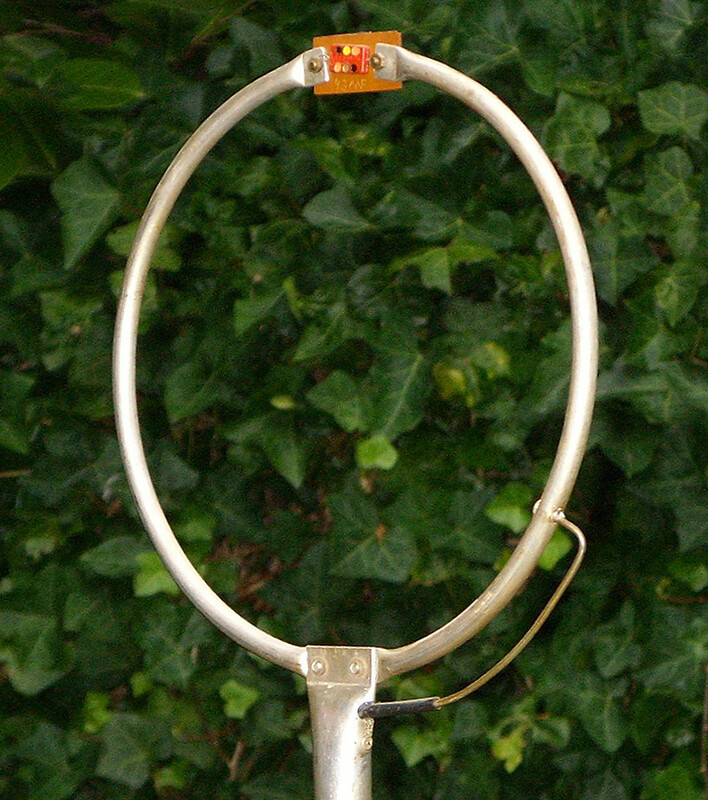 I have had very good results with the Hula Hoop antenna. It is a shade over 26" OD. Made from 1/2" copper tubing. Was trolling thru many searches & found this build. It beat my 4bay by 3-4 channels. I pull in channels from all directions. As for the whisker antenna, the "V"'s are 10" in length, 5.25" space @ outer end & the spacing is @ 9.5". I have removed the whisker antenna & placed a basic "hoverman" at the base of the chimney 8' in height. Picked up a few more stations with the hove versus the whisker unit. I have them tied into an A/B switch that seems to work so far. Have ordered a CM7777 preamp, see how that works out. The old chimney is dormant. Was thinking about building another hula hoop & mount it vertical just to see what it would do. Also thought about replacing the #10 whiskers with 3/8" or 1/2" copper tube spikes. Here's a photo of my quickie "Project-Zero" antenna, vertically oriented. I can pull two screws and reorient it horizontally in less than a minute. It is an old original UHF Loop that came with along with a TV set I bought many years ago, so it's not sized for the current band (or is it?). It did not behave (directionally) as I expected on any channel, possibly because the balun needs to be shielded by enclosing it in a metal box. Thanks for the photos. On the side opposite the feedline, is the loop electrically connected or is this antenna essentially a pair of dipoles? Mine is a completed loop. Good eye! 2 half moons, that's the way the completed project was shown in the forum. I thought about making it a complete loop, but figured I would give this a try first. Wouldn't take much to connect the loop together. Built a Stealth Hawk today & am trying that out, kind of nice being able to switch back & forth between antennas. Omnidirectional antennas receive the 'strongest' signal as well as the same signal reflected from other directions (multipath) thus by definition or in theory your goal to build a good omni-antenna is a waste of time because "multipath interference" confuses digital tuners. On the other hand, I consider myself to be an Imagineer and not an Engineer where their rules do not hold back my experimentation. Ptttth on that nonsense. 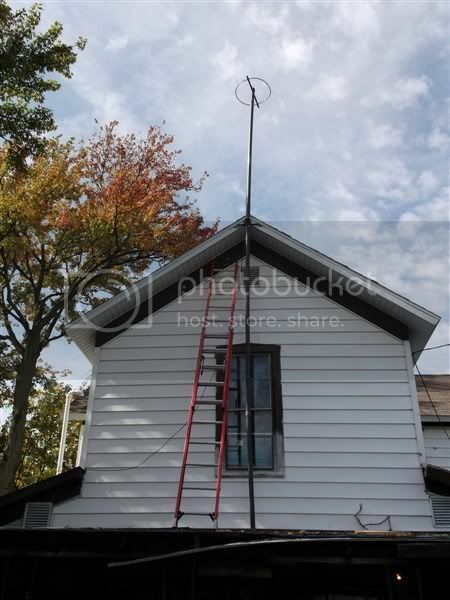 Odds are, in my location an omni antenna would have limited use BUT I have reviewed dozens of TVFOOL reports from around the Nation and some of them might be able to take advantage of an omni antenna -- if a good one existed. Definitions are subject to interpretation & theories are just educated guesses. Connected the 1/2 loops together & ran a scan with signal strength...no difference. Picture quality was the same. 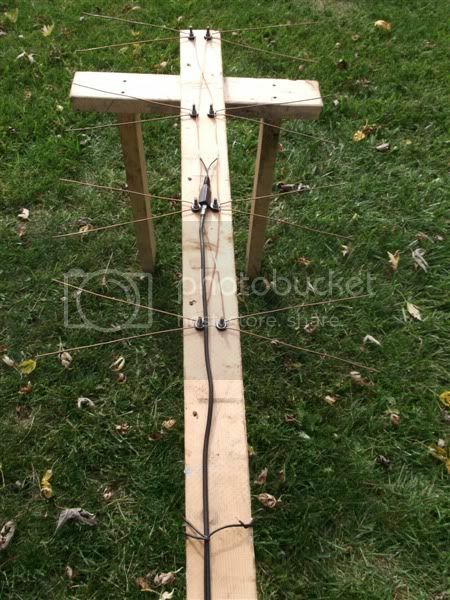 Be nice to see some other ideas for the loop antenna. 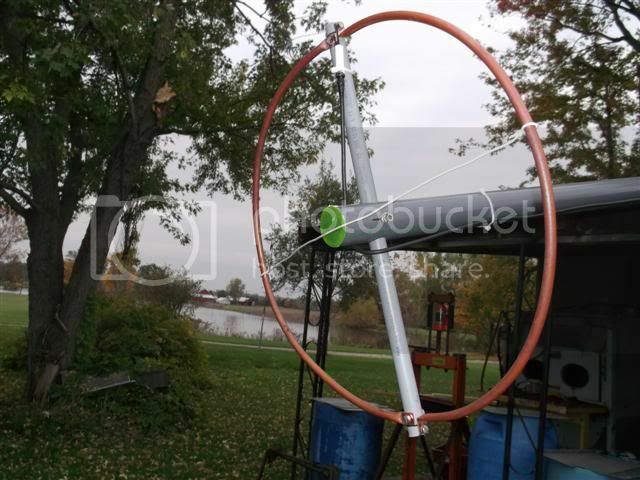 I think one would be hard pressed to find any good ideas for the use of a loop antenna since they pale in comparison to other UHF antennas such as yaqis and bowties. Omni directional antennas are inferior to those, as well as directional loops when picking up fringe signals from any particular direction. Using an omni directional is a huge sacrifice when trying to achieve dtv reception from a significant distance . Everyone has an opinion about most everything. I know for a fact that the loop that I constructed is much better than the bowtie, hoverman & hawk as far as number of channels received & the quality of the picture. Best part is I don't have to aim the loop. No rotor needed. In my situation it worked out to be the best antenna so far. I pick up Dayton & Ft. Wayne stations with very little problem. I would consider those stations to be of a significant distance from my home. I used it on the 10-meter Ham band (the band was out/no solar flares) only twice to "find" two (known) local transmitters (a W7 and a K7) and on the 15 meter Ham band to "find" the same local transmitters plus a K3 "portable-7". Dialing in the variable capacitor at the top of the Loop is ABSOLUTELY CRITICAL or this Loop is completely dead (not resonant). BUT ... this should be THE hall-of-fame Loop antenna for 11 meter cbs'er "rabbit hunting'. Compared to a 9 foot whip (quarter wave) on a car, believe it on not this Loop is only around 15dbd down (no way to prove this) making it an amazingly live antenna. I used this Loop many times for 'fox hunts' to find CB mobile (stationary) CB radio transmitters as far as 12 miles distant and this Loop was the best/most accurate/most "awake" antenna of different Loop versions we worked with. With this Loop tuned (peaked) for receiving and with a Johnson "Matchbox" in circuit it was (is) an amazing bi-directional mobile transmiting antenna ... yes, comparatively short range but absolutely bi-directional and VERY narrow beam width. My question: since this Loop is just under 10 inches in diameter and can be made resonate AND directional as well as "awake" when the (received) wavelength is 36 feet @ 27 mHz ... does the actual size of a loop matter? If frequency range is based on breaking a Loop of any size on top and adding capacitance (or possibly inductance (???) - how do we determine those values? 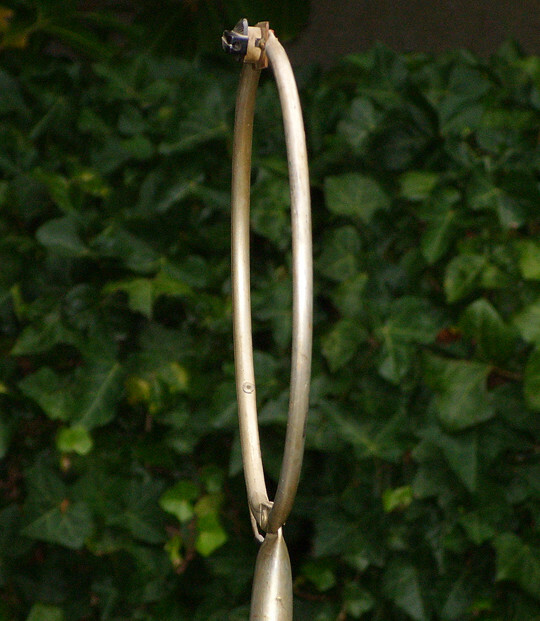 Post 1 on this thread shows an open Loop mounted horizonally. When the same Loop was closed (later post) there was no change in his TV reception. <--NOTE: here are TWO variations for Loop design. 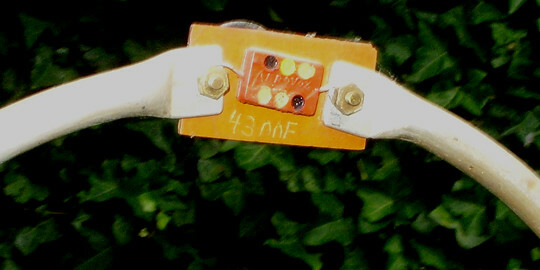 Above, I posted a photo of a test antenna completed / closed "bottom-fed" Loop via a standard 300:75 ohm balun. <--- 3rd design. 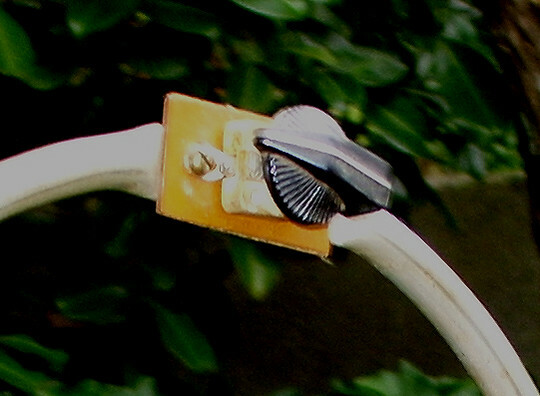 The Loop antenna shown below is 'broken' at its' top and capacitance is added in the gap AND it is fed via a Gamma "matcher" much like many transmitting Yagi antennas. This is a 4th variation on the Loop Theme posted here --- so far. 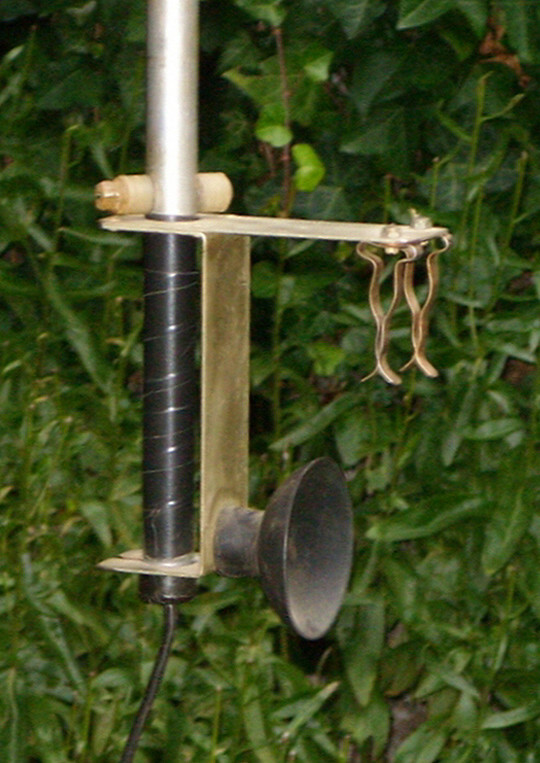 The second photo shows the antenna pointed AT a transmitter -- NOT broadside but with the Loop almost aligned "sideways". The suction cup and spring steel goodies on the base are meant to clasp a side window on a car. Does anyone else have other variations to contribute and/or experiences and/or other designs and details? My Uncle who passed away a few years back was into the 10/11 meter radio. He bought a commercially available loop for tracking down the the loudmouths running "heaters" in the neighborhood. If I remember right, it was around 8-9 inches in diameter & was hand held. Didn't take long to track down the a**holes. One guy had his antenna hidden in a tree, really had to look for it, he had camouflaged by painting it brown-green. 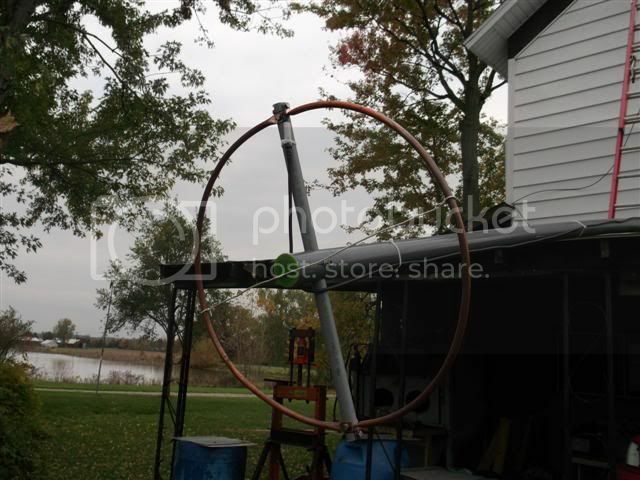 So far I have tried the 26" Horizontal double dipole, 26" vertical loop and a 9" vertical loop. Results from the vertical loops, same stations received & quality of picture with strength. Loops do work, and so does my secret design !! Loop antennas do work. Stack two of them together cut at around channel 33 with an insulated center hub and balun, and in essence you will have a C-2 double loop antenna, just like the Clear Stream. Look at the gain numbers for my antenna that is in the hands of a patent attorney right now. This is a direct line of sight at 30 miles at 2000 feet elevation on channel 20. I have achieved incredible RF gain numbers, and basically perfect data stream numbers. This signal level would essentially overload some receivers, and attenuation would be needed to overcome the high RF Levels. THE DATA SCREEN ABOVE IS NOT FROM A LOOP DESIGN IN ANY WAY !!! Level (Gain) = Amount of electrical energy received by the antenna and feed line combination. The higher the number the more energy that is received. Pilot Level = The portion of the radio signal used by the DTV Receiver to lock in on the Data stream. This needs to be in a certain range, neither to high or to low. dimmers, and many other man made electrical noise sources present in the radio spectrum..
such as the exciter, or a poorly tuned, or non linear amplifier output stage. Rough double loop details. This works well, and is CHEAP to build. For informational purposes only !! The outer driven element dimensions can be cut larger and then trimmed to find your best match. Information for experimental purposes only !! 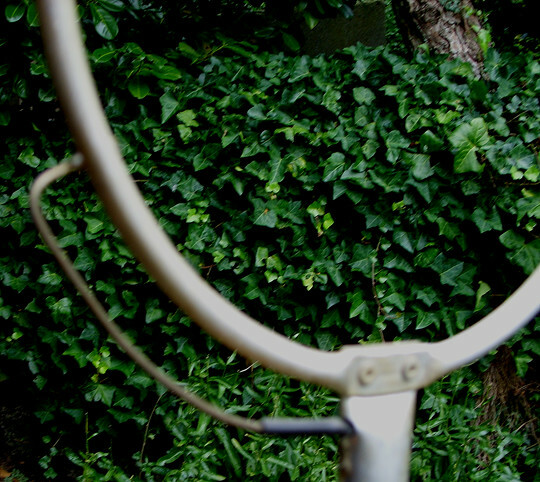 Double loop antennas are nothing new. 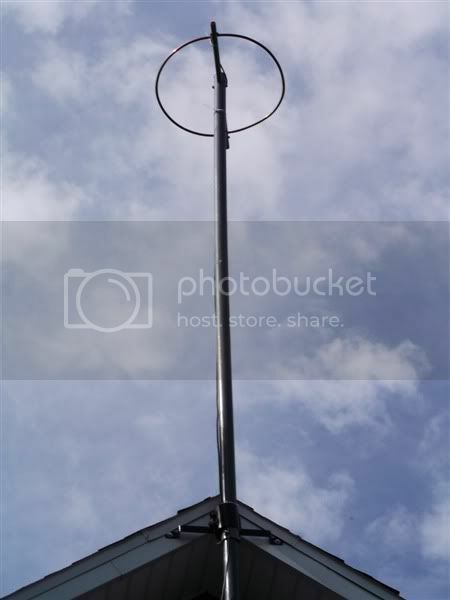 I even found a pic of an old triple loop antenna. What makes you think there is any real engineering in that antenna? It looks like artwork to me. If it was a decent antenna it would be available today. could i get this in more detail i'm a noob.so 2, 26" halfs how many feet of tubeing would i buy to make those? 3.4 ft per half? i'm not sure help me out please.